I was super excited when Smartwool announced their release of updated Phd line. I always been a big fan of Smartwool and been using them pretty much for anything. Summer, winter, short distance and Marathon. So I drove a an hour to the local Smartwool store "Ramseys Outdoor Sport". Maybe everything went wrong from the start, when I entered the so called "release party" a young high school girl asked med if I wanted to try the new hiking socks from Smartwool. Friendly I asked if I could try the running sock instead. But apparently Smartwool only sent the "hiking" sock to try on this US nation "release party". Very disappointed I had to drive home empty handed. Later when I got home I ordered the socks from an online store. The new Smartwool Phd Run Ultra Light Mini. We maximize the amount of wool against the skin in all our products, because more wool against the skin provides more comfort. Specifically in our PhD socks, we created WOW™ Technology, (Wool-on-Wool). Here, we've replaced some of the nylon in the high impact zones with more Merino wool to the heel and forefoot, so you can enjoy more wool comfort. The 4 DEGREE FIT SYSTEM in our PhD socks is a proprietary four-point sport supportive system that provides an incredibly secure, comfortable fit around the heel, arch and instep. Im a size 9.5 and I'm kind of in between sizes when it comes to most sock brands. So I had to order the Large size. My Smartwool felt to big on my feet. I never got the snugg and secure fit the advertising and the new 4 degree fit system promised, although it felt comfortable enough, so I decided to use them for my upcoming marathon. I tried the socks for about for 4 longer runs before the race and did not have any really issues other then the snugg fit. Around mile 15 at the marathon I started to feel blister under my arch. Never had this happen before with other socks and my shoes was well broken in and have never caused me issues. My old Smartwool never caused me any issues like this and they also had a snugger fit?!? The blisters did not slow me down during the marathon, but they were very present and caused discomfort. 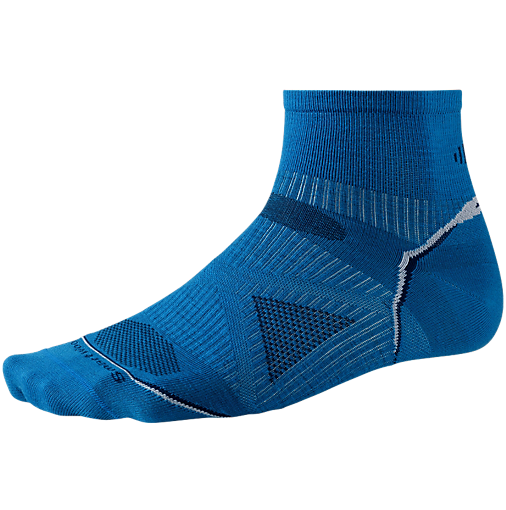 Smartwool has alway been very pricy and with other socks in this price range you get a Right/Left foot specific sock.You would have thought when Right/Left foot socks is kind of a standard these days Smartwool would have done the same when they updated their socks? By doing so I think Smartwool would have had a "game changer" and a sock with much better fit. The feeling of the new Smartwool is less "woolish" then the old version. When I buy wool I buy them for the wool feel as well as a good fit. Conclusion: With the same price as the old version, you get a sock with less wool feeling as the old version. If you re between sizes, the fit lacks. When going for Large as Im a 9.5 the sock felt sloppy. One of the most pricy sock out there lacks the Right/Left feet specific features.